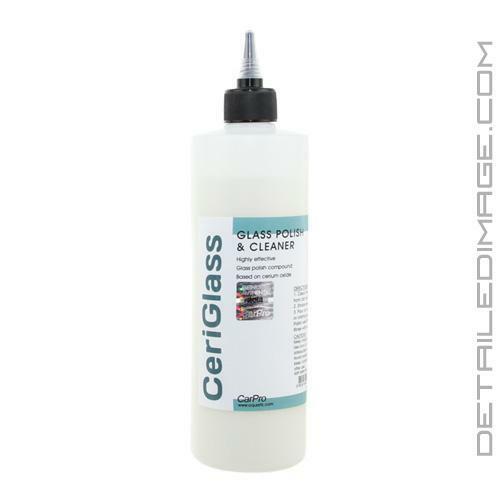 CarPro Ceriglass Glass Polish deep cleans your glass safely and easily so you can see through it and drive safely. This unique formula will remove acid rain, hard water, road film, sap, bird droppings, and even fine to medium scratches from your glass! Ceriglass is formulated with cerium oxide, mild abrasives designed for glass and other nano particles that deep clean your glass with ease. You can polish by hand or even by machine. If you polish by hand you can deep clean the glass but with a buffer (Rotary or DA) you can remove deep etchings and even light to medium scratches! It should not be used on tinted glass, aftermarket glass and coated glass surfaces. It will not distort glass and upon completion you'll finally be able to see through the glass clearly in direct sunlight or on rainy days. 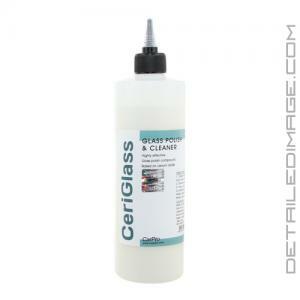 Pick yourself up some CarPro Ceriglass Glass Polish today! Clean the surface from dirt oil & dust. This product really works. At first I had my doubts but after setting the buffer at 5800 and patience, it removed some really deep scratches from a power pole came down and the cables scratched the windshield. 1 hour later, the scratches were gone. Love this product. Had etched glass and extremely hard water spots on my own 2008 Honda Accord. Nothing could get them out but this polish with my Porter Cable and Griots Garage Glass Polishing Pads worked perfectly. Glass like new. Worked for me. Used it to polish the windows of my 87' Monte Carlo SS, after years of neglect and water spots and it has improved the window clarity by about 70%. I plan on doing the process again, which may get 100% results. That being said, it's not a one step type of deal here. You may have to do it more than once.